Me and My SoldierMan: GIVEAWAY!! GIVEAWAY!! GIVEAWAY!! I am so excited!! It's time for my long-promised giveaway!! I am also excited because this is my first official sponsored giveaway! My friend Melanie is an Independent Scentsy Consultant (visit her site here) and has generously agreed to provide this giveaway prize! Isn't that awesome?? And anyway, I just ordered my very first full-sized warmer! I saw they had a new collegiate line for the fall, and you know I was all over that! But for today's giveaway, you are entering for your choice of a plug-in warmer and 3 scents! Isn't that a sweet deal?? And because I know you are as excited about this as I am, I want to make sure you have as many chances to enter as possible! Visit Melanie's Scentsy site and comment back here with the plug-in warmer design and 3 Scentsy scents you would choose should you win. For a bonus 2 entries: Have your reply-to email set! Don't know how or what I am talking about? Click the link at the top to find out! ~Count how many times I used the words "excited" and "awesome" in this post (I know, it got a little ridiculous, but I can't help myself!) - 1 entry! ~Post about this giveaway on your blog (with link back) - 1 entry! ~Include my button in the post - 1 entry! ~Every person you refer here - 2 entries! ~Sign up for Melanie's Scentsy newsletter - 5 entries! ~Place an order on Melanie's site (be sure to include some sort of comment in the order with your blogger ID) - 5 entries! There's only 1 rule: We need a minimum of 30 bloggers to enter. So start working those referrals! Giveaway ends midnight (my time) next Thursday! Happy shopping! P.S. My OU warmer came just as I posted this. Isn't it awesome????? super sweet giveaway! i don't think the links work. actually when i hovered, nothing showed up. and i clicked everywhere and no link. sorry. but trust me... i am all over this one! LOVE your giveaway! I like the lime plug in from the dandy collection and the scents i like are clean breeze, white tea & cactus and welcome home! I like any of the Dandy ones. As for scents I like Autumn Sunset, Cranberry Spice, Welcome Home. You crack me up with the reply e-mail issue! Mine is set! We've had several little chats that way! And I think I'm supposed to tell you that my reply e-mail is set again...since it's two entries? Sorry, I'm really not the best with simple instructions..
and my Email is set too!!! Um, yeah. 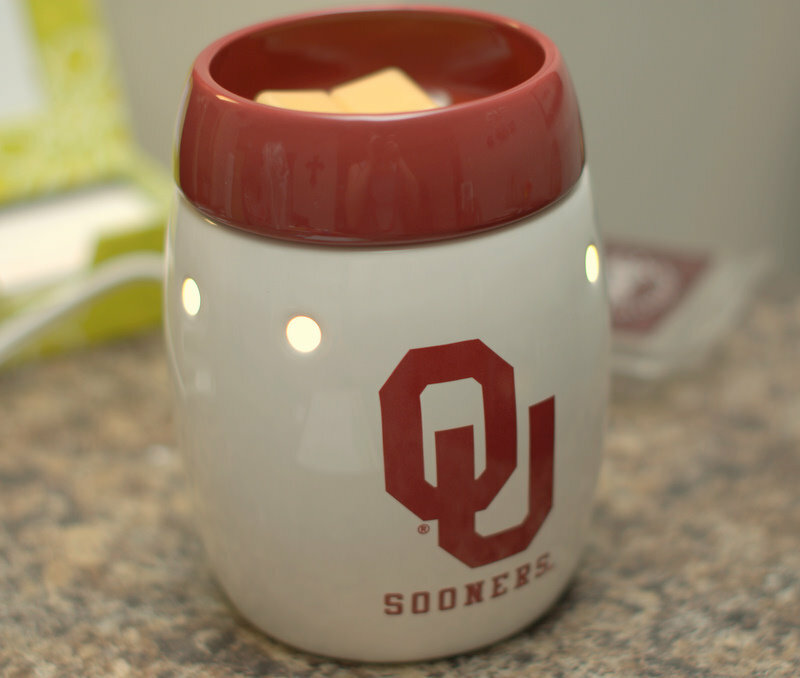 Pretty sure I want the OU warmer too. =D Hehehehe! I'm super excited about this giveaway! oh and my reply to email is set! So, I just realized that you said which PLUG-IN I wanted. Woops. =) In that case, I'd go for the Dandy Turquoise Plug-in. I cant choose between the Lei warmer orr the black groovy one. The scents I like are the tropical flavors and wild rasberry. :) Yay! If I were to win, I'd choose the white plug in from the Groovy Collection. For scents I'd try Mayflower, Rainforest, and Lush Gardenia. Do I need to comment a second time if my reply-to is set? I'd love to win! I love the Boho Chic warmer and the autumn sunset, black raspbery and cinnamon cider bars! mmm! Bonus entry: totally have my email set! 2nd comment for my bonus entry! I think you said excited and awesome 7 times? But I'm obviously retarded because you said "plug-on" lol In that case, i love the dandy turquoise! If I won, I'd choose the Taro plug-in I think it's called. (The last one on the top row) and would get the Baked Apple Pie, Autumn Sunset, and French Lavendar scents! #2. My email is set! #3 You said "excited" and "awesome" a total of 7 times. If it makes you feel any better, I probably would have used them more. I'm very excited about this awesome giveaway! but it's a great giveaway regardless!! I love the starfish plug in and I would love to have the Camu Camu, perfectly pomegranate, and the sunkissed citrus scents. i almost forgot ] Entry #2 for having my reply-to set. I like the plug-in: Lei Plug-In Scentsy Warmer. Scents: Apple Pie, Cutiepie Cupcake, Cherry Limeade, Cinnamon Bear, Cinnamon Cider, all of the Romance collection, Beach, and Mediterranean Spa. I couldn't pick just three! I like the Dandy Turquoise Plug-in Scentsy Warmer with the Coconut Lemongrass Scentsy Bar, Cherry Limeade Scentsy Bar and the Cucumber Lime Scentsy Bar. There were way too many choices on her website;) But my favorite warmer is the Taro design. My reply-to email is set! LOL! You said excited--4 times and awesome--2 times...including the ones in the giveaway instructions! BTW, this giveaway is awesome and I am excited about possibly winning!! You said awesome and excited for a total of 6 times. My email is set up. YOu have emailed me several times! So I know it works! HA! My email is an entry! I love the Dandy Lime Plug-In and the 3 scents would be: Pumpkin Roll, Sticky Cinnamon Bun, and Autumn Sunset! AAWWW the smells of fall! the starfish one! Would go great in my seaside bathroom! and the scents....where do I begin!!!! Autumn Sunset, baked apple pie and welcome home are all the ones I'd get! It sounds perfect for fall! I love the Dandy Turquoise one, although, the Taro or Grotto plug-in would probably better match my decor! The scents I would pick would be: Coconut Lemongrass, Honey Pear Cider, Camu Camu and maybe the Black Raspberry Vanilla - it's so hard to choose! I wish I could smell them! My reply to e-mail is set! Since it's worth two entries, here's another comment to let you know that my reply to e-mail is set! You used the word "excited" 4 times (including in the giveaway instructions) and "amazing" 2 times (including in the giveaway instructions). The page was taking awhile to load, so I'm hoping I counted correctly! you said the word excited 4 times, and the word awesome 3 times. and i used your button in my post! just remembered that we'll be moving to germany nad own't be able to use these. but if i did win, i guess i could gift it to someone... completely begrudeonly (how do you spell the word i'm trying to use) b/c i would really like one. Ahhh, what a hard choice!! I would love the starfish plug-in. For my 3 scents- Coconut Lemongrass, Havana Cabana, & Cinnamon Bear. Hi! I love the "Waves" plug in warmer. The scents I like are: Sunkissed Citrus, Perfectly Pomegranate, and Camu Camu. You use excited or awesome 4 times, if you don't count the question where you say excited and awesome, haha. So that is a tough question. I would want Weave Scarlett. I already have 2 of the warmers to match the bathrooms so I think that one would match the kitchen/living room in my new house. But since I haven't seen my new house I am not sure how I will decorate, which is why the question was super tough! Scents... I love all of the baking type ones! Right now I wish I had more sugar cookie, camu camu, and cinnamon cider sounds yummy! my reply email is set! I'm lovin the Dandy Turquoise. And Mocha doodle. And Cutiepie cupcake. And coconut Palm. And now I obviously need an Almond Joy as that seems to be forefront on my mind. And pretty sure you have my email. Yeaaaahhhh! I'm a lover of all things nautical, so I would definitely go with the Waves plug-in warmer. I'd go with the black raspberry vanilla, pretty in pink, and welcome home scents. This is also for the "reply to" email being set. You used "excited" four times, and "awesome" three times. I also signed up for Melanie's Scentsy newsletter. I think this is entry #4 for me - I posted about your giveaway! I would get the Taro plug in. The scents would be Black raspberry vanilla, vanilla cream, and perfectly pomegranate. 2nd comment because I have my "reply-to" email set!! I <3 the botanical grotto plugin, the one you have a pic of up above! and the secents that tickle my fancy ;) are baked apple, cinnamon cider, and mochadoodle!!! I gave you another shot out.. does that give me entry number 5?? Is it obvious how badly I really really want to win this! I love, love, love the Taro in the Botanical collection. Scent picks are: orange dreamsicle, sunkissed citrus, and white tea & cactus. Thanks for your last minute reminder - I completely forgot to comment! I actually love the Boho Chic design. I would do cinnamon cider, beach and the cucumber lime scents! I LOVE the sand dollar plug in!!!!!!!!!!!!!!!!!!!!!!!!!!!!!!!!!!!!!!!!!!!!!!!! Awesome and excited a total of 7 times! Reply to email address is set!! My "reply-to" email address is set too. I like the Grotto Plug-In in the Botanical Collection and my top three scents are Baked Apple Pie, Caramel Spice, and Cinnamon Cider. I like Caramel Spice, Sticky Cinnamon Bun, and Plumeria. The Scarlett plug in is my preference. The scents I like are Cherry Limeade, Coconut Lemongrass and Just Peachy, Ginger! and I adore the Lei Plug-In but really any of the botanicals would be great! I love the Taro Plug-In warmer! I love the apple pie, coconut lemongrass, and havana cabana! My favorite is the Sand Dollar warmer and anything that smells like fall. And the McGriff's sent me. This a really great giveaway! ;) I would want the Lei plug-in warmer. The three scents would be Baked Apple pie, Cinnamon Bear, and Cutiepie cupcake. I set that up a couple weeks ago and have been loving the responses! You said awesome and excited 7 times. I don't blame you for being so excited! Phew, you sure got a lot of entires now! I'd like to enter too, please! My choice for the plug-in would be the Botanical Taro. My choices for scents would be Autumn Sunset, Camu Camu, and Welcome Home (because my love returns home from Afghanistan oh so soon!). Excited & awesome were used 7 times! Second entry for having my reply-to email set. I like the Weave Scarlett warmer and with welcome home,autumn sunset and coconut lemongrass. I hope you reach your number!! I believe you said excited and awesome 7 times (total). It's not ridiculous, I love saying "awesome"! Oh, and I like the Taro warmer with sunkissed citrus, vanilla cream, and Christmas cottage scents. So I went back through and counted.. I just blogged about this! Fabulous giveaway! If I won, I'd love the Taro Plug-In Scentsy Warmer. And since I have a huge sweet tooth, I'd go for all scents from the bakery collection: cupcake, sugar cookie, and caramel sugar. Yum! Bonus #1 - Have my email set! Just FYI so in case something looks familiar. I had no idea how to do a giveaway so I completely copied your wording. Please don't hate me :o) It's for a good cause! !